London Bridge is one of the best known landmarks in London England. 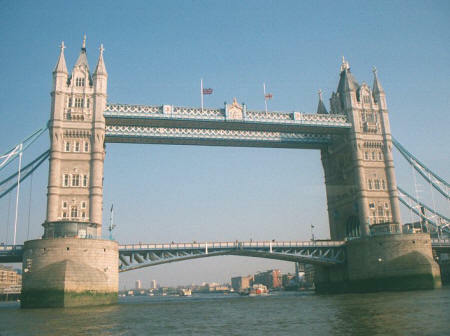 Officially called "Tower Bridge", this combined bascule and suspension bridge consists of two 213 foot towers. The central 200 foot central span can be raised to permit ships to pass underneath. Visitors to London England can learn about London Bridge in an exhibition called the "Tower Bridge Experience" that is located in the towers. London Bridge is also a great location from which to take photographs of the Thames River and the London skyline.